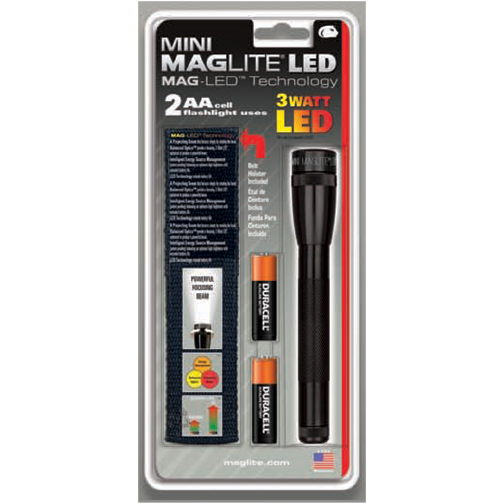 The NEW AAA Mini Mag-Lite® LED is the brightest flashlight in a small package with only 2 AAA batteries. AAA Mini MagLite® LED Flashlight. Mag-Lite® now answers your dreams of making a "familiar friend" even brighter. The original AAA version was introduced over 25 years ago. This new LED member of the family is the same size and shape. Same simple operation, just twist the head to turn it on and off, and adjust the focus of the beam. This new intensity is amazing. Made in USA. Still has a pocket clip, and still not much bigger than a penlight. Colors: Black, Blue, Red, Gray, Rose Gold. Laser Engraving - appears white. Price includes engraving one location (head or barrel). 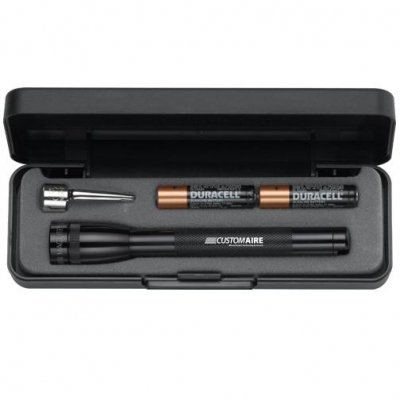 See our instructional video page, "How The Mag-Lite® 2AALED Flashlight Outshines Most Other Ones"